As a Christian marriage counselor and marriage educator who’s worked with thousands of couples over the past sixteen years, my experience certainly confirms these findings. I’d go so far as to say that in almost every struggling marriage I’ve worked with, at least one of these patterns is a major contributor to their difficulties. And so I believe that crucial to the success of any marriage, is for couples to eliminate, or at least reduce the occurrence these four negative behavior patterns from their relationships . Over the next several issues, I want to discuss these four patterns, and suggest practical ways to reduce and avoid them. The first of which is escalation. Escalation occurs when partners respond back and forth negatively to each other, continually upping the ante while the conversation gets more and more volatile. Even just a minor negative comment can increase the level of arousal and soon a small disagreement escalates into a major fight. Escalation can develop over something as small as not putting the lid back on the toothpaste, or eating the last chocolate chip cookie. As the conversation revs up, partners start to become more and more aroused. Then before they know it, they are saying mean things to and about one another. Frequently spouses bring up the “D” word with threats to end the relationship. As emotions escalate, verbal communication often deteriorates, and unwary spouses can start hurling words that hurt each other and damage the feelings of love and closeness they once had. Proverbs 12:18 says, “Reckless words pierce like a sword.” Oneness and intimacy can be shattered quickly by a few reckless words, and when that happens, the marriage relationship is damaged severely. The research shows that those couples whose marriages failed, frequently exhibited this pattern of escalation, allowing conversations to escalate and spin out of control. On the other hand, the research shows that successful couples whose marriages last, are less prone to let conversations escalate into damaging interactions. With these couples, if a conversation starts to escalate, they are able to steer out of the tailspin before it ends up in a full-blown crash. You may be thinking, “Well we don’t fight like cats and dogs, like that.” And while that may be true, your marriage could still be at risk to this factor in another more subtle way. 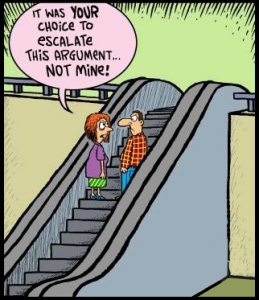 The reason: Escalation is not always dramatic. Voices don’t have to be raised for couples to get into a cycle of returning negative for negative. Conversations over paying the rent, taking out the garbage, running errands that result in muttering to oneself, rolling your eyes, or throwing up your hands can also be examples of escalation. Even a casual conversation with your spouse can take a sharp turn and go the wrong direction if you let it. The good news is, you don’t have to let it. James writes, “If anyone considers himself religious and yet does not keep a tight rein on his tongue, he deceives himself and his religion is worthless” (James 1:26). And the Apostle Peter admonishes us, “Do not repay evil with evil or insult with insult.” Having a a healthy marriage requires counteracting the tendency to escalate as a couple. With God’s help you can learn to control your emotions and to keep a close rein on your tongue. How? You can’t always control what’s coming toward you. But you can, however, decide to respond instead of react. And the way you respond can make all the difference in the world. In the Proverbs 12:18 passage we saw earlier, “Reckless words pierce like a sword, but the tongue of the wise brings healing,” the latter part of the verse gives us the key. There’s a wise way to respond to whatever words may come your way. When the conversation starts to escalate, rather than allowing yourself to react, be intentional and determine to respond wisely. Instead of impulsively reacting out of habit, resolve to respond purposefully. By doing so, you can stay in control no matter what may happen. How? Scripture offers us some wise counsel here, James 1:19 tells us: “My dear brothers, take note of this: Everyone should be quick to listen, slow to speak and slow to become angry…” In other words, think…pause…then speak. It’s a wise person who can communicate in this way. But all too often, in the rush to be heard, we speak first and then think next…and unfortunately with poor results. We must measure our words carefully. Words are important: they can hurt or heal. Words can uplift us or discourage us, and reckless words, spoken in haste, cannot be erased. Respond carefully. Speak wisely, not impulsively. Stay calm. Pray. Slow down. Use words seasoned with grace, not words of criticism or insult. Remember you can steer out of a tailspin and build your spouse and your marriage up, rather than tearing them down. Decide and determine now, with God’s help to respond wisely, with healing and comfort rather than escalation and anger. To locate a Christian marriage counselor in your area email us at info@marriageministry.org. For more articles like this check out our Facebook page.